So where does Neptune, Lord of the Sea, Tempestuous Ruler of Ideals, Dreams, Delusions and the Masses, stay when he needs a little break from the incessant waves? Any seaside town can put up a blue plaque in his name, of course –and if you’ve ever veered up Queen’s Rd on a Saturday night, you’ll know that Brighton offers much to tempt the King of Addiction. Having just returned from a week in Ukraine, however, my vote for the sea god’s favourite earthly hotel goes to Odesa. This is no light-hearted accolade: the distinction is not necessarily one to covet and I’m bestowing it on Odesa because its short history embodies both extremes of the astrological Neptune’s immersive yet turbulent nature. Odesa (Оде́са in Ukrainian; Оде́сса in Russian), a city of just over a million people, is located on the coast of the Black Sea on a site once settled by the ancient Greeks and later the Tatars. Founded in 1794 by Catherine II, herself a German; laid out by a Spaniard, José de Ribas, whose design paid homage to the site’s Hellenistic roots; and first governed by a Frenchman, the Duc de Richelieu, the city epitomises Ukraine’s precarious footing on the fault line between Russia and Europe. 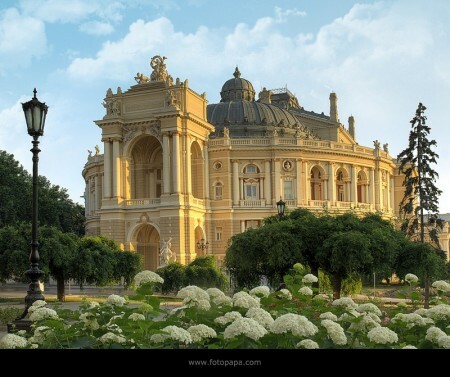 As Alexander Pushkin – who spent a year of his youth here in a descending series of hotels – famously said, ‘Odesa smells of Europe’, and even the city’s name has a apocryphal whiff of French perfume about it. Though chosen to pay homage to the ancient Greek city Odessos (Catherine insisted on a feminine ending), according to local legend the name derives from an early hydrogeological report claiming ‘Assez d’eau’ (there is enough water’) – when this proved false, de Ribas neatly reversed the phrase. To quote an English poet, ‘Water, water everywhere, nor any drop to drink’: the astrological Neptune’s trade in illusions is present right from Odesa’s start. And yet the city’s founding is also steeped in Neptunian idealism. From the beginning the city advertised itself as a beacon of freedom, progress and multicultural cooperation. Labourers flocked here for the opportunity to live as paid workers, not serfs, while Richelieu’s establishment of a world-class theatre, Lyceum and library attracted a worldly assortment of artists, writers, scientists and entrepreneurs. As my charming guidebook has it, Odesa was the city that ‘became famous from the cradle, where people of more than a hundred nationalities found bread, shelter and a new homeland, the city that always preferred gold to lead . . .’ The Milton Keynes of the Tsars is known in Russia as the Pearl of the South; the city’s own citizens dubbed her ‘Odesa-mama’ and, in thanks to her fertile steppes, appointed Ceres, the Roman goddess of the harvest as her presiding spirit. From an astrological point of view, this rulership neatly corresponds to Odesa’s sun sign, Virgo the Empress, and rising sign the maternal Cancer. But Odesa-mama is no dour peasant matriarch: depicted in an old city mural as ‘Ekaterina’, she rests her arm on the cog of industrial revolution, and flaunts a winged rod, symbol of Mercury, god of commerce and quick wit – as the de Ribas story suggests, Odesans are also known for their lively word play. This famous sense of humour is also said to owe a debt to the previously large Jewish population – at one point in the early twentieth century nearly 45% of the city’s inhabitants were Jews. That population now stands at 6%. For Neptune lashes at Ceres’ shores, and for complex historical reasons – that cannot and must not be reduced to a sea god’s jealous tirades – this butterscotch bastion of creativity and tolerance has also been the site of some of the modern era’s most infamous crimes against humanity. Throughout the nineteenth and early twentieth centuries, Odesan Jews triumphed against sustained persecution, being subject to a series of pogroms from 1821 to 1905, the latter committed with the support of the Tsarist military. In 1905, as well, Tsarist forces fired on demonstrators in the city, anonymous deaths immortalised in 1925 by Soviet filmmaker Sergei Eisenstein in his silent classic The Battleship Potemkin. Eisenstein staged the massacre on the monumental Richelieu Stairs leading down the cliffs to the port – now known as the Potemkin Stairs, though in fact, in a Neptunian twist of illusion, innocent of the killings. But as the pogroms demonstrate, there is no need to fictionalise atrocities in Odesa. In the thirties the Holodomor, the Soviet-created famine that killed between 3 and 6 million Ukrainians, made a corpse-littered nightmare of the city streets. And in 1941, after heroically helping to defend the city for 73 days, Odesa’s Jews were massacred in one of the most exhaustive slaughters committed by the Nazi regime: over a period of three days Romanian and German forces, aided by local authorities, shot or burned alive at least 25,000 Jews. 35,000 others were sent to perish in the camps, and over the next months nearly all of the remaining Jews in the city were exterminated. At the museum I was told that only 600 people survived the events of 1941-2. While the population did grow somewhat after the war, many Jews understandably washed their hands of Odesa forever, settling largely in America or Israel. But while the worst, the Nazi atrocities were not the last of Odesan massacres. On May 2 this year, painful memories of the Holocaust were evoked when 42 pro-Russian separatists were killed in the firebombing of the Trade Unions building – a terrifying and still highly controversial event, sparked by earlier street clashes during which pro-Ukrainian marchers were killed. The historical Jewish presence in Odesa is still felt through its tragic absence – even the shuddering of the old train stock down from L’viv seemed to echo the fear of tens of thousands of people packed into similar carriages and sent to the death camps. 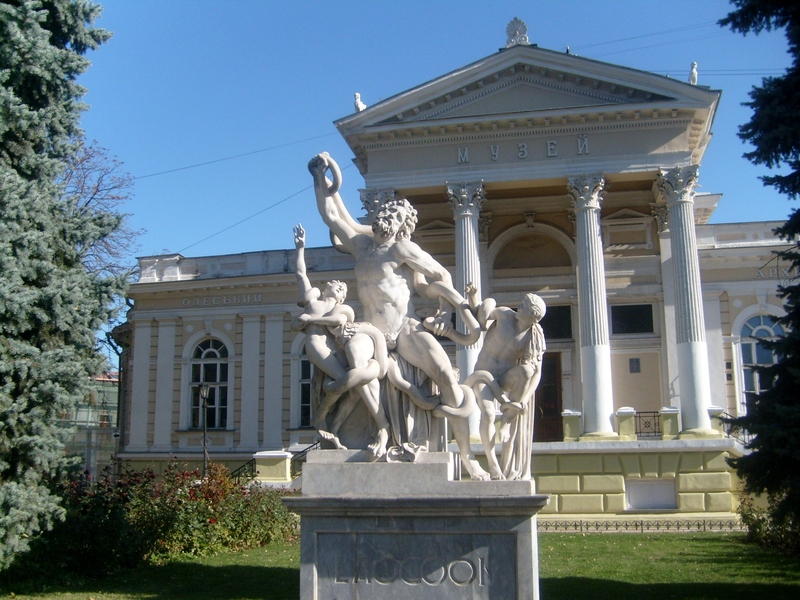 But at the same time, the current Jewish population is prominent and proud, operating tours and maintaining the small but well-tended Odesa Jewish Museum. When I visited, the young guide was adamant that the Trade Unions fire did not reflect the atmosphere of a city in which people still live in communal blocks of flats, sharing space and facilities with their neighbours. Anti-Semitic leaflets from as recently as 2007 were on display, but our guide declared that these vile attempts at rousing old hatreds were rare, and that she feels safe here today. Or at least as safe as any Odesan. For with a majority of Russian-speaking inhabitants and Crimea just down the coast, the city feels the cold eye of Vladmir Putin roving over it. But Russian speaking does not equate to Russian separatism: though tensions can run dangerously high, the city as a whole accommodates its mixed population and historical ties to Moscow well – many people are bilingual at least, and since gaining its independence from the former Soviet empire, Odesa has acknowledged its debt to Russia with a new statue of Catherine and her lovers. Most of the Ukrainians I met suspect that separatist sentiments here, as elsewhere, are in fact stoked by Moscow. On-going investigations into the Trades Union fire have already included the arrest of several Russian nationals; if these people are truly provocateurs, this is a grave violation of Ukrainian sovereignty – any grievances of Russian-speakers must be aired in a proper democratic manner, free of the militaristic interference that is causing the current devastating war in the East. Astrologically, war is ruled by Mars, the belligerent strategist. Neptunian violence may be triggered or enabled by war, but is of a different nature – irrational outbursts of fear and rage, the depths of human darkness engulfing militants and masses alike. In a certain light, Odesa is like a stately ghost hotel, haunted by the shades of those who have perished in the bloody storms that periodically wash through its elegant streets. For both good and ill, Neptune maintains a luxury suite here, the replica statue of Laocoon outside the Museum of Archeology a warning reminder of his powers: a Trojan priest of Poseidon, Laocoon enraged the god by making love to his wife in the temple, for which act of impiety he and his sons were killed by sea serpents. But after my all-too-brief visit, my hope is that Odesa-mama may yet curb the sea god’s temper, and continue to nurture his creative and spiritual nature. All astrological speculations aside, this extravagant city’s founding commitment to freedom, multiculturalism, humour and beauty deserves a chance to fully bloom.